I am in St. Petersburg, Russia and soon will start trip to Russian North. Below is note which I wrote long ago but failed to sent it to you somehow. It used to be KGB in Russia and FBI in USA who had files on everybody. Now their functions were taken by Google. Google knows everything about everybody on Earth. You can type your name in Google and you will find all information about YOU, which is available in enormous space of Internet. My last name is unique. There is no other Mumzhiu on Internet except for me and members of my family. If you type Mumzhiu in Google you will find about 1200 links. If you will type it in Cyrillic characters, Google will give you another 300 links. I already reported you before about one of my funny finding: teenage boy in small Siberian town wrote to his peers on travel bulletin board that "funny granddaddy Mumzhia is not Georgian but African American"
There is some more interesting findings: http://sharkattacksurvivors.com/attack/viewtopic.php?p=1004 This site reports all shark attacks. They mentioned my name between people bitten and eaten by sharks in 2005. To be fair, I attacked shark first.But most interesting mentioning is this. It was initiated by my friend Katia Antonova from St. Petersburg, who put short notice about my trips on on her web page. Two people replied that they already new me. One put my pictures, another wrote that he regularly meet me in cafe in Peterburg where I communicated with cosmos??? In both cases it was not me. It is so funny. Take a look at: http://katyart.livejournal.com/2006/01/02/ For your convenience I also put it in attachment Unfortunately it is available in Russian only. Давно уже хотелось написать об этом человеке,и вот пользуясь посленовогодним затишьем наконец-то пишу.Однажды летом на Невском проспекте, пытаясь затащить велосипед в фотомагазин Яркий Мир я познакомилась с удивительным чековеком, таким Афанасием Никитиным (ну или Марко Поло если хотите)нашего времени.Это был (и есть), пожалуй единственный счастливый пенсионер из всех, которых я знаю. Не буду отвлекаться на грустную тему о том насколько, по моим наблюдением несчастны наши родители, бабушки и дедушки в России (кстати, я хотела вас спросить, хоть у кого-нибудь из вас есть пожилые родственники, которые счастливы? Мне было бы приятно услышать хоть один утвердительный ответ). Но я ухожу от темы. Когда я затаскивала велик в магазин, то увидела что около двери стоит человек с очень странным велосипедом, маленькие колесики,такой почти детский велосипедик. Голубые яркие глаза, загорелый и вполне жизнерадостного вида, несмотря на то, что по виду ему около 60 лет. Я с ним разговорилась, начав разговор с того, что я никогда не вмдела подобных велосипедов. И вот что он мне рассказал. Когда-то он жил, как и я сейчас, в Питере, на Васильевском острове. Уже много лет назад в 1979 году он уехал в Америку, там работал, и когда вышел на пенсию, то сел на этот велосипед (из-за болезни ног он не может долго ходить пешком), и поехал. За последние 6-7 лет он объехал более 60 стран.Он забирается совершенно один (точнее со своим велосипедиком) в самые опасные и недоступные уголки планеты. Тут карта его путешествий и путевые заметки на английском языке http://groups.yahoo.com/group/alextravel/ и в переводе на русский http://nnberg.narod.ru/mumzhiu/index.html К сожалению на русский переведено далеко не все, последних записок 2005 года о Ямайке на русском нет . Это единственный пенсионер на моей памяти, который мне сказал - я очень везучий и счастливый человек. I am in St. Petersburg. I came here 3 weeks ago with the intention to take a trip to the Russian North. But a few circumstances forced me to stay longer than I expected, and learn some unpleasant features of everyday life in Russia with which every Russian citizen has to deal. Back home in America I had fallen in my bathroom and injured my shoulder and knee. My falls looked pretty random, but deep inside I know what was the reason. It was withdrawal symptom, a common thing for all kind of addicts, travel addicts includeded. I did not travel for too long, was unhappy because of this, drink too much and as a result I fell and was injured. It never happened before in wild jungles, high mountains or deep water, because I am always alert and prepared there. It also proved the well known fact that your bathroom is the most dangerous place in the world. Anyhow I came to Russia with these two injuries and I expected that they will heel soon as it usually happens. It did not happen and I had to look for a medical assistance. My friends explained to me that in Russia you do not need the doctor's prescription to get most medical procedures. I know that I needed an MRI, so I went to diagnostic center, paid $100 and got an MRI. It was real torture. It took about 40 minutes, the pain in my shoulder was incredible. I asked an operator how old is this MRI machine. She said it was purchased 3 years ago. These machines were used in USA probably 15 years ago. With this MRI, I went to a doctor. I paid $15 for a visit. The doctor was sitting in a small room with a fan, no AC in spite of very hot air. He was unable to understand the MRI, but he removed liquid from my knee (bursit). It still cost only $15. In America such procedure should be around $500. It was a short description of events. In fact I encountered many strange situations and irresolvable circumstances . Experienced Russian friends explained to me that these scheduling clerks have very little salary and they expect a little donation (bribe) from clients. In order to extract for sure their fair donation they artificially create some difficulties in scheduling, organizing and providing for the most insignificant events . All Russians know how much they should pay or what kind of small present they should give to smooth the process. It can be as small as box of candies. For a person who is not used to it, it is awful. You cannot believe that the problems you were told about, which ruin your plans and schedule can be resolved with a little gift which cost couple dollars. After I learned how the system works, I relatively easily get an appointment with a good orthopedic surgeon, who explained to me what happened with my shoulder. The pain in the shoulder will continue, because I tore my tendon, he said. But I decided that I can go to my trip with it. The consultation was ridiculously cheap by American standards, only $30. My trip will be to Northern parts of Russia, and may be Norway and Finland. I tried to go there three years ago. But because of heavy rain in that area I canceled the trip, and went to Mongolia instead. Now I will try it again. I am starting my trip tonight !!!!!!! It will start from Petrozavodsk on Onega lake and continue through Zaonejie (land behind Onega lake) to city of Kargopol and than Archangel. I worked in Zaonejie in my summer vacation in 1968, I collected resin from pine tries (jivitsa). I earned 130 rubles for one month, which was rather modest pay for this tough work. But I spent a month in the magnificent forest and lived with my mother in a pretty picturesque, now abandoned, village. 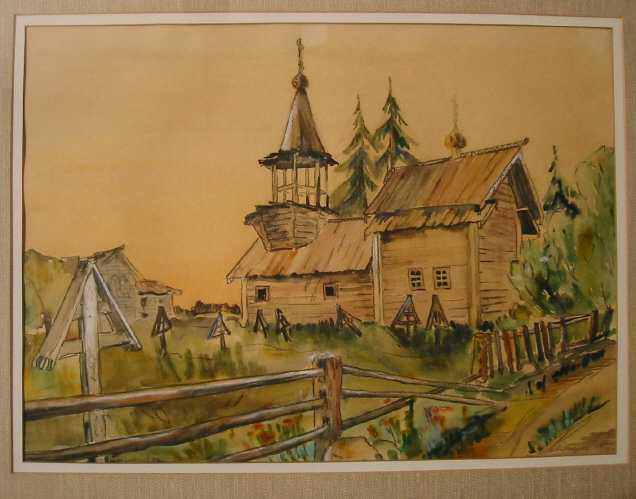 My wife came on a weekend from Leningrad and made a painting of the wooden church standing right in front of the house where we lived. Picture is attached. I really want to see what happened with these pastoral places in 38 years. From Archangel, I will take a ferry to Solovetsky Islands, another remarkable place with deep historical roots. 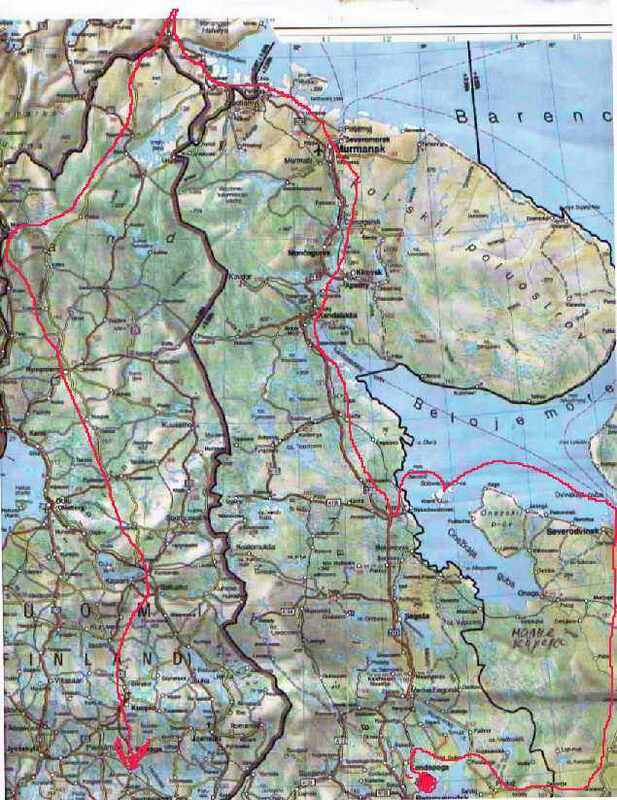 From Solovetsky Islands I will go to Murmansk and across the border to Northern part of Norway. Than down through Finland to Helsinki. It will be mostly a camping trip. IF YOU ARE YOUNGER THAN 18, OR YOU ARE AT WORK DO NOT OPEN PICTURE OF SPB STREET SCENE IN ATTACHMENT. Since I did not switch to blog format yet, I would like to send you the most interesting replies on my last Travel Notes. "Sorry to hear about your injuries and unpleasant encounters with Russian reality. We had similar experiences - many situations were difficult only because we didn't know which hands to tip. On the other side if you know how much and whom to pay, than life became much easier, even compared with America." "What about a trip thru west virginia, or northern maryland instead. They sure have MRIs out there. In Pertozadovdsk you may fall again from that horse, or just get yourself killed for those few bucks that you may still have, monsenior voyagor. Nature wise sweden for instance is as bautiful as korelia, just much more civilized. Hostels included." As I already wrote to you the most dangerous place for me was my bathroom. Shoulder is still in some pain. My reader from Petersburg Liza Ch. sent picture with comment "It is hot here" Temperature in SPB reached 34 C.
I am in Petrozavodsk. It is nice here, not hot. I am staying in former Intourist hotel Severnaya for $15 per night. Competition start to make a dent in outrageously high hotel prices in Russia. Even in SPB I saw pretty decent new hostels in $16-18 range. So soon backpackers may start to visit SPB. Let me know if somebody needs addresses. I would like to remind you that if you know somebody who wishes to receive my notes they may subscribe to the Alextravel group mailing list. You should reply to the letter which Yahoo will send you back, (just click "reply" and "sent"). Surprisingly many people missed this second step and did not get subscribed. My boat from Petrozavodsk to Velikaya Gyba through Kizhi was late. I also made some wrong turns on my way to Seletskoe, the village where I worked collecting sap in my summer vacation of 1968. Weather was gloomy - rainy and cold (5C, 40 F). Road was series of paddles, see picture. I did not see any car during my entire trip to Seletskoe and back. I expected to find at least some even abandoned homes, in Seletskoe, because camping in such weather would be not fun. It was pretty late when I came to the place where village Seletskoe standed 36 years ago. I was shocked, entire village was gone. No single house, even ruin was standing there, only tall wet grass. But church was there. It was no path through the tall grass to the entrance. While I walked through the grass my clothes gets wet. For such Northern trips I have to buy some Gortex stuff. As I tried to open gate to the church yard, entire fence almost fell off, see picture. Church was not locked and I entered inside. Church was in much better shape than 40 years ago. It was restored. However it was no any trace of recent human presence there. It was restored... and abandoned, amazing! Nearby cemetery was where it was before, on the Southern side of church. Across the road from cemetery, the house where I lived with my mother was standing. My wife draw the picture of church from this point. It was only grass there. I made a photograph of church from that point, see picture. You may compare it with picture drawn by my wife, which I sent you before. Church is largely overgrown by the trees. Other picture of church made from the opposite side. I erected tent inside the church vestibule and prepare to go to sleep. Cemetery, abandoned church.... pretty scare stuff. It was complete silence there. I never experience such silence. Suddenly, loud noise broke the silence. Heart fainted would have heart attack. It was a bird. Door leading from church to the roof was stolen, and bird (lastochka) entered through this hole. It was the only vandalism I found in church. Bird made a nest and it was three chicks there. Then they get used to my presence, they became pretty noisy. I felt sorry that my friend Vladia, who understand birds and animals language is not here. Entire next day it was rain and I stay in church for second night. I collected rain water and even made a soup. It was no place to make a fire there. But if you keep contents of soup pocket in cold water for several hours, it is became eatable. Next morning weather was gloomy, but it was no rain and I decided to go back to Petrozavodsk. I am not properly equipped for camping trip in such bad weather condition. When I exited my tent, I found that I cannot stand straight. I can only be in bended position. I probably spent to much time laying on church floor. I knew that my the only salvation is bike. My bike is not only transportation means. It is also medical exercising machine for my back, injured many years ago. As always bike helped. Coupe hours later I was OK. I am in Petrozavodsk, waiting for better weather. All world is suffering from the heat, but it is pretty cold and rainy here. Before talking about Solovetsky Islands I should say something about Petrozavodsk, where I spent a few days. Surprisingly Petrozavodsk turned out to be a nice provincial town with mild and polite traffic. People are friendly and go out of their way trying to help the stranger. Even sales ladies are polite. It is strong Finnish influence here. Many store's names are in Russian and Finnish. I noticed here some signs of "Finlandization" similar to these in Tallinn, Estonia. On my way from Seletskoe I visited Kizhi, which is as beautiful as always. Few pictures are in attachment. From Petrozavodsk I took the night train to Kem. You have to take night train because boat to Solovetsky Islands starts at 7 am. Solovetsky Islands far exceed my expectation. In addition to its historical and architectural features, it is perfect natural preserve. Nature is so ecologically clean here, that you will no doubt be able to drink water from rivers and lakes. It is very impressive 15 century fortress/monastery here with 10 meters thick walls. Ironically it was never used for serious military purpose. However it was used as prison camp SLON (Solovetsky Lager Osobogo Naznachenia) in Stalin's time. About 40,000 prisoners died here. Pictures and artifacts from the museum refreshed in my memory pictures from my own childhood spent in prison camp with my mother during WWII. We were not prisoners, but my mother was assigned to work in camp as an accountant and most of people we were surrounded by, were so called political prisoners. Visitors at Solovki are special type with large proportion of painters, art restorers, movie makers and historians, no new Russians. Local people are also nice. They never lock their doors here. I stayed in a private home for $8 per night. There is a very good cafe here. The combination of good quality, low price and good service make it one of the best I saw in Russia. Russians, like Chinese prefer to travel in groups, so all service is oriented toward groups. independent travelers sometimes have a difficult time. From Solovetskii Islands I went to Kirovsk. The mining town, Kirovsk is located in the center of the Kola peninsula in the middle of Hibiny Mountains and is starting point of many wilderness trips and also it is a ski resort. I was in Kirovsk many times before and I love it. I wanted to see how it is doing now. Kirovsk met me with cold rain and I have to wear a winter hat, gloves and wool socks, which I bought still in Petrozavodsk. Kirovsk used to be prosperous town, a showpiece of the Soviet economy. Now Kirovsk is not in a good shape, many buildings are abandoned. Unlike Peterburg, where tons of new restaurant and cafe is open now, there is no a single restaurant in Kirovsk. However central square with statue of Lenin is under restoration, but during the last night somebody stole 26 flagstone plate tiles dedicated for paving the central square. The local TV reported about it. But the most amazing example of widespread stealing I saw, was at Appatity train station. Somebody stole the steps from the staircase leading towards the train station, see picture. While I was in Kirovsk many times I never read tour books on it. The Lonely Planet recommended to take a look at old train station. I did not know that a train station exists in Kirovsk. This pompous train station, see picture was build just for show-off business (Potemkinskie derevni) and actually never was needed. There is no passenger train service to Kirovsk. On bike Kirovsk seems very small. I rode bike toward Kykiswumchoor mountain pass, from which most wilderness trips started. I also hitch-hiked to plateau Raswumchoor, where open quarry for mineral appatit is located. The plateau Raswoomchor which is 1000 meters high, met me with its famous hurricane wind and cold. The mine is working. I even got a decent dinner in its worker's restaurant. But probably after the Soviet Union fell apart, the mine had a difficult time. There is a lot of abandoned earth moving equipment here, such as gigantic open quarry trucks, excavators and enormous "Belaz" trucks. See pictures. From here the plateau Raswoomchorr, 30 years ago I started my best ski trip to village Lovosero. This trip was 150 km long, but it takes only 1.5 days, due to good snow conditions. I conceived this trip myself and was ready to go alone. But in the last moment one girl from friendly ski group decided to join me. I was not very happy about it, because the trip supposed to be tough, we have to cross two difficult mountain passes. We get onto the plateau Raswoomchor also by hitchhiking on a worker's truck. After we start skiing, I realized that I barely can follow the girl. She turned out to be a member of the Soviet Union racing ski team. We spent the night at lake Seidosero at a fisherman's log cabin, came to Lovosero at mid-day and returned to Kirovsk in the evening, just in time for a May 1 party. This time I went down from plateau to Kirovsk on bike and saw new ski lifts, built 4 years ago. Skiing was always good at Kirovsk and ski season continues here till June. Unlike mining, ski business in Kirovsk is growing. Several new ski lifts were built in other places too. Price of ski lift is about $12 per day. Open quarry at Plateau Raswumchoor. Next stop in my Northern Russia tour was Archangelsk. City of Archangelsk had its heydays two times in its history. First during the Ivan the Terrible time, when it was Russia's the only seaport. After Peter the Great cut window to Europe, the importance of Archangelsk diminished. Second time it was during cold war. Nuclear submarine factory was build in closed city Severodvinsk, and Cosmodrom was build near village Plesetsk. I visited Severodvinsk. The latest large order for shipbuilding factory was the platform for lifting sinked submarine Kyrsk. Part of city is located on the island Yagra and this part has a beach on a while Sea shore. It is normal beach with changing cabins. You can see it on picture. People next to me however wear woolen jackets. On my way to island I had a chance to see shipbuilding factory and some of its products (izdelia), half submerged from the water. I also tried to get to cosmodrom. I remember how easy it was at Kennedy space center, Florida. Not in here. They even did not allow to enter the town Mirnii, providing support for the cosmodrom. It is allowed only with permission given to group of tourists, ironically mostly foreign tourists. Archangelsk itself is not in a good shape. Unlike Petrozavodsk, which I visited before, Archangelsk did not managed to get help from foreign donors. A waterfront of Petrozavodsk is in a perfect shape and it is filled with abstract sculptures provided by foreign donors. Archangelsk waterfront has even more amazing structure, see picture. A large piece of embankment grate is miracly held while ground under it is washed away. From Archangelsk I went to Malie Koreli, the museum of Russian wooden architecture. It is nice but not as nice as Kizhi. And it has completely different atmosphere. People allowed to picnic and drink there. The atmosphere remind me somehow the Buddhist relaxation center near Vientian, Laos. From Archangelsk I went to Vologda. It looks like Vologda is still living in the USSR. There are two hairdressers and one cashier in small government run hairdresser shop. In railroad hotel, half a dozen mid aged women in dirty gray overall discuss their problems while customers are waiting to be allowed to their rooms. All service personnel enjoy giving lectures to customers. Old town Vologda however has many churches some of them are quite nice. From Vologda I went on bus to Ferapontovo and than by bike to Kirillow. While most of icons of famous painter Dionisii are removed from Ferapontovo to Kirillow, Ferapontovo is definitely worth a visit. A location of its Kremlin on the shore of two lakes is tranquil. Kremlin in Kirillow is very impressive. It was the only fortress which was able to resist Polish-Lithuanian attack in 1612. Moscow did not. It is many tourists in both town, mostly foreigners. People in Ferapontovo and Kirillow are nice. Like in Solovki, the fact that they live in such famous places make them behave nicer. Service people here do not have a habit to give lecture to customers, anyhow most of customers are foreigners and they will not understand. However thing which I enjoy most, is their specific VOlOgOdskii ascent. It is so funny, sometimes it is so thick that I thought that they do it on purposely. "What I am doing here? I have a nice home in Washington. Why I spent entire summer traveling in dilapidated rail cars between places like Niandoma, Konosha, Kandalaksha, Kondopoga." These names are usually associated in Russia with deep ugly province. Rain outside became heavier and I looked on schedule of trains going South. In two hours it was train to Sochi (resort on Black Sea), and I bought ticket on it. I will sent you my last report from Russian North later. For now I would like to tell you what happened during the stopover in London on my way back from Russia to USA. I went to the Brompton factory to get a part which I need for my bike, specifically the hing bolt. I also would like to see Brompton because for 7 years I was riding Brompton around the world and picture of my bike in front of Everest mountain is on their web page. Visit was very satisfying. I got the part, talked with founder Andrew Ritchie and was given a tour around the factory. While I was at Brompton my wife and son, who also were in London, went to Cambridge and accidentally met Heinz Stucke. According to Guinness book of Records, Heinz is the most traveled man in human history. The train from the White sea to the Black sea took 3 nights and 2 days. After my bad experience with neighbors on the trip through Trans Siberian Rail Road three years ago, I travel only in platskartnii rail car (open compartment), not kypeinii (closed compartments). For me trip was OK, but average American probably will be miserable there. I never was a big fan of Sochi . Now it became even worse. It looks like rednecks from all Russia jumped in here. In addition there is heavy traffic, lots of people and a special brand of capitalism -- Russian capitalism. In Soviet times there was a popular saying "Volchii oskal kapitalizma." This translates as rough capitalism, like a wolf baring its teeth. The capitalism here is this type. I rode bike from Sochi to a border with Abhazia. It was like riding though giant and agly store, endless car repair shops, building material stores, all kind of junk selling stores but only couple small cafes. As I crossed the boarder everything changed-- not a single store, just beautiful subtropical nature. Uncertain future of Abhazia prevent business people from investing money here. And, at least for nature, it is good. Main town of Abhasia is Sykhymi. I was in Sukhymi many times, usually on my way from mountaineering camps in Caucasus mountains . Poor Sukhymi, how badly it was damaged during the war with Georgia! It was heavy and bloody war. Abhazians fight to be part of Russia, not Georgia . Average Russian will not distinguish Abhazian person from Georgian one. They also speak with the same funny Georgian accent. However, as it often happened, these close cousins - are bitter enemies. Probably half of buildings in Sykhymi are abandoned. Streets are patrolled by UN observers. But somehow city saved its pleasant character. When I rode the small streets of the town filled with playing children and walking families, I felt the mellow character of this city. Public electrical car (troleibus) sometimes stop on its route to allow mother pig with piglets to cross the street. Abandoned and ruined buildings even add some "Wild West" charm to city, like in Havanna. Tourism return to Sykhumi, but slowly. Recent conflict with Georgia in Kodory valley does not help too. However the sea is warm, the sky is blue with snowy mountains on horizon. Food is good and dirt cheap. Thick meat soup (harcho) plus 150 ml of vodka and tea cost just $2.5. Soup is so thick that locals eat it with fork. Especially good is coffee sold at every corner for $0.20. Housing is cheap too. I rent a room from chief doctor of local hospital for $5 per night. People start to live better here, especially retired people, after Putin (as they say) give them Russian pension. It is funny, in Russia retired people think of their pensions as miserable ones. I bought a mask and did some wreck snorkeling at the territory of abandoned fish cannery plant. Several ships were slinked there during war. Usually I bought a smoked fish and melon on the market in the morning and rode my bike to end of town where fish plant is located. Nearby at lighthouse, a tamed dolphin called Romah is playing with people and beg for fish from fisherman. A big letter R engraved on his fin. Local said he escaped from Sochi delphinarium. People are very nice here. Abhazians feel they have to be nice to Russian tourists because they want to be part of Russia . It is only 300,000 of them, so it is unrealistic to fight for independence from both Russia and Georgia. Without Russian support, Georgia will swallow them.